I would like to offer a fresh introduction to L. Sprague de Camp–one of the old guard in the art of speculative fiction and an inspiration for the familiar shape of the world in many current role playing games. Some of you may already know him. If you don’t, you might want to. In his time de Camp was an aeronautical engineer, World War II Navy Reserve veteran, and the witty, prolific, and inspired author of several speculative classics as well as other works on a wide-ranging assortment of topics. In addition to his voluminous output of short fiction, de Camp wrote more than a hundred books over his sixty-year career, ranging from science fiction and fantasy to nonfiction about science fiction and fantasy, evolution, archaeology, and biography. De Camp was a major author during science fiction’s Golden Age in the 1930s. John W. Campbell, then-editor of the seminal magazine Astounding, published a great number of de Camp’s stories during that decade. According to the L. Sprague de Camp Fan Site, it was also during this period that he met fellow author Fletcher Pratt, and the two writers began a long collaborative relationship. Through the forties and fifties they produced the humorous Compleat Enchanter fantasies about Harold Shea, psychologist and alternate-world explorer. The character proved so popular that years after Pratt’s death de Camp revived the series with Christopher Stasheff. When World War II broke out it disrupted a great many writing careers, and de Camp’s was among them. De Camp joined the U.S. 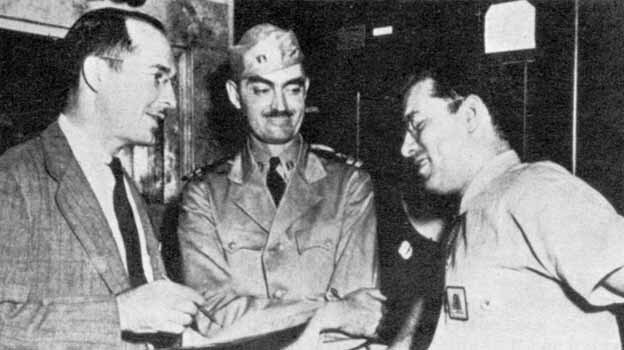 Naval Reserve in 1942, where he worked as a researcher in the Philadelphia Naval Yard with Isaac Asimov and Robert Heinlein. Like several other notable science fiction and fantasy authors of the Golden Age, de Camp came from a scientific background which informed the content and direction of both his fiction and his nonfiction. Most of these Golden Age authors also knew each other, and their interactions built the framework for many of the classic tropes of the genre. De Camp’s creative trajectory is detailed in the Encyclopedia of Science Fiction. In the mid-1950s his Science Fiction Handbook (1953; revised in 1973 with his wife, Catherine Crook de Camp) offered advice to budding writers from the front lines of speculative fiction. But shortly after telling people how to follow in his footsteps, de Camp moved away from science fiction in favor of heroic fantasy, especially the sword and sorcery kind. He resurrected the character and epic world of Conan the Barbarian by editing Robert E. Howard’s existing cannon, completing Howard’s unfinished manuscripts, and adding additional tales of his own to the original body of work. After this immersion in Conan’s world, he went on to author a definitive biography of Howard. His work helped to bring sword and sorcery back into popularity after a lull when speculative fiction had gone in other directions. By the early 1960s, the fantasy world was ready for barbarians again. De Camp edited the first-ever sword and sorcery anthology in 1963, called, fittingly enough, Swords and Sorcery, that contained eight stories from the masters. 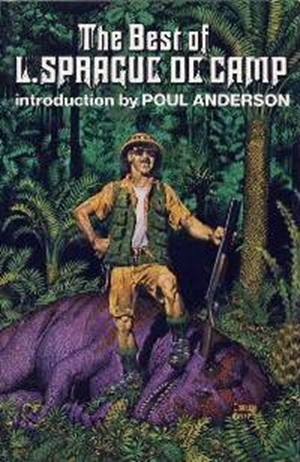 De Camp was also one of the original members of the Swordsmen and Sorcerers’ Guild of America, otherwise known as SAGA, along with fellow heroic fantasy authors Lin Carter (who really is the reason that SAGA begins), Poul Anderson, John Jakes, Michael Morecock, Fritz Leiber, Jack Vance, and Andre Norton. With them, de Camp was at the forefront of rekindling interest in this particular brand of fantasy adventure, and of laying the groundwork for what would become the archetypal world of early RPGs. But he didn’t limit himself to fiction. 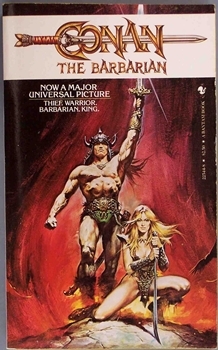 De Camp also wrote extensively about sword and sorcery as a genre in the nonfiction anthologies The Conan Reader (1968), Literary Swordsmen and Sorcerers (1976) and Blond Barbarians and Noble Savages (1975). These essay collections explored the authors who created the genre and their various contributions to its evolution and form. In addition, de Camp was a biographer of other fantasy authors, producing excellent works on both H.P. Lovecraft (no longer the definitive biography, but still a remarkable portrait of the man) and Robert E. Howard after editing their respective works. In addition to his fantasy-themed nonfiction, de Camp also spent considerable energy on debunking pseudoscience and fancifully inaccurate history, joining the Committee to Scientifically Investigate Claims of the Paranormal (or the pithier abbreviation, CSICOP) with such luminaries of rationality as Carl Sagan, Isaac Asimov, Martin Gardner, B.F. Skinner, and James Randi. Much like Houdini before him, de Camp felt it was important to distinguish the imagined or illusory from the actual, and to prevent the less scrupulous from using fantasy and parlor tricks to prey on the gullible. He produced some lovely explanations for and take-downs of pseudoscience and extraterrestrial-attributed history in his books The Ancient Engineers, Ancient Ruins and Archeology, and Great Cities of the Ancient World, because like most of the speculative authors and professional magicians he associated with, he knew he was selling fiction as fiction. De Camp earned many awards over his career, including the Gandalf, the SFWA Grand Master, the World Fantasy Lifetime Achievement, and the Pilgrim. His own autobiography won a Hugo in 1996. While many of his books have gone out of print, a number of his more popular titles (including some of those listed above) are still available at L. Sprague de Camp’s Amazon Author Page. I highly recommend his nonfiction, in particular The Ancient Engineers. Believe me, de Camp is an author worth knowing.